A Simple Question Towards Belonging: What Do You Love? 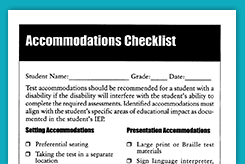 Choose from our list of printables to help you with special needs students. 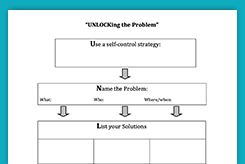 Includes charts to track behavior management, planning for diverse students, accommodations checklist and for IEPs, and adaptations to help with disabled students. Our collection of Classroom Management and Discipline resources will help new teachers as well as veteran teachers. Includes references with guidance for managing disruptive behavior, characteristics of effective behavior managers, and much more. With these resources, you will be guided through principles of assessment accommodation and provided a checklist, as well as preparing for IEPs, designing and implementing portfolio assessments, and more. Guidelines and resources for teaching English Language Learners and insuring they are involved in classroom activities are provided to help, not only the new teacher, but the veteran teacher as well. Teachers are provided resources and suggestions for modifying behavior when needed and to help with various classroom and social situations. 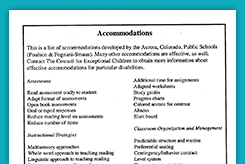 Adaptations and suggestions are provided to teachers concerning the use of different educational technology tools to assist students or as assessment accommodation tools. Tips for teachers of gifted students in a regular classroom who need differentiation are provided, as well as a composite list of typical characteristics to identify and teach disabled/gifted students. 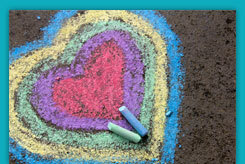 Browse through our extensive list of resources on ADD/ADHD to find what you need. Topics included are suggestions for modifications, criteria to help identify ADD or ADHD students and suggestions to provide them with educational support, planning differentiated lessons, and much more. What Can Teachers Do To Help a Child with AD/HD? Use our resources to choose the best approach for teaching students with Autism or Asperger's in your classroom. Resources include matching social interaction to the needs of your students, peer tutoring, and direct skill instruction. Various techniques, tips, and suggestions for teaching emotionally and behaviorally challenged students are included in these resources, such as, using stories about children with disabilities to teach others, and proactive tips and effective techniques in your classroom. Help students with disabilities, as well as those without disabilities, prepare for and cope with natural or man-made disasters, and the grief that could come as a result with these resources. Choose from these resources to extend your students' learning. Includes activities to improve reading skills, principles to help make reading adaptations in an inclusive classroom, and more. Classroom atmosphere and time management are critical aspects of teaching. These resources include ways to manage time effectively and to promote a positive disposition in students towards math, as well as ways to adapt the math curriculum for special needs students. Use these resources to teach students about those without vision and the Seeing Eye Dogs who help them. Students will practice writing skills such as writing from another's perspective. Our collections of resources will help enhance your teaching strategies by having students read, learn, and ultimately write a story about the Great Wall of China and more. Help socially competent and normally hearing students interact with autistic or deaf students in the classroom and social settings with these resources and guidelines. New teachers and veteran teachers alike will enjoy these resources. 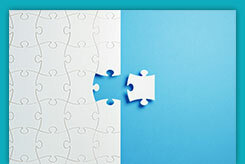 Includes information about how an inclusion classroom works, strategies to help you teach effectively, and information on how collaboration between general education and special education teachers is vital.